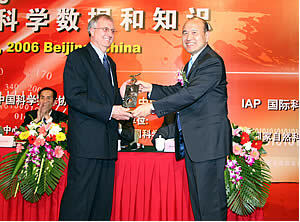 Marking the 40th Anniversary of our organisation, the 20th International CODATA Conference, held in Beijing, China, 23-25 October 2006, had the title "Scientific Data and Knowledge Within the Information Society", continuing the emphasis on CODATA's role in the Information Society expressed by the title of the previous conference ("The Information Society: New Horizons for Science") and the organisation's involvement in the World Summit on the Information Society and related activities over the past few years. Also running through the programme was a sense of CODATA's evaluation of its own purpose, reflected in a retrospective view of its past 40 years of existence, and a session looking to its future directions. Once again the CODATA Conference brought together an astonishing variety of topics and speakers covering every aspect of data science. In the China Resources Hotel Beijing, over 600 participants from 31 countries and regions in the world made this conference the largest contribution then and a successful international event. 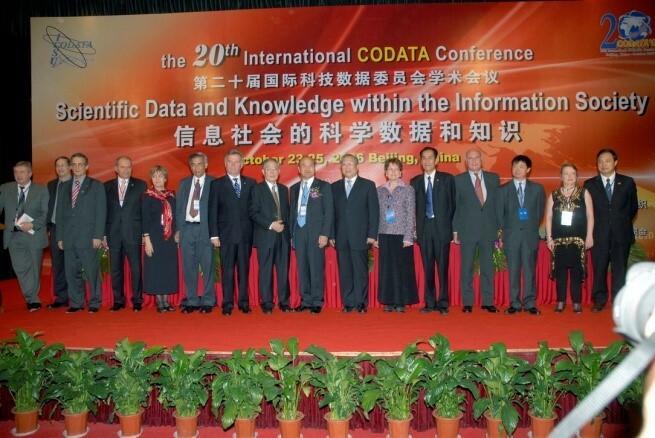 Lu Yongxiang, Vice-chairman of the National People's Congress and President of CAS, and Shuichi Iwata, CODATA President co-chaired the CODATA 2006 Conference. Zhou Guangzhao, Vice-chairman of the Ninth National People's Congress, Xu Guanhua, Minister of the Ministry of Science and Technology of PRC (MOST), Chen Yiyu, Chairman of the National Natural Science Foundation of China (NSFC), Jane Lubchenco, former President of the International Council for Scientific Unions (ICSU) and Stanislav Nikolaienko, Minister of the Ministry of Scientific Education of Ukraine were also present and addressed the conference. Page based on the article published on CODATA 20th Conference website (Brian McMahon's report) and in the Chinese Academy of Science (CAS) Newsletter.